In this two-part tutorial, originally published in Docma Magazine, gallereplay co-founder Lydia Dietsch explains how cinemagraphs can be created using Adobe Photoshop. 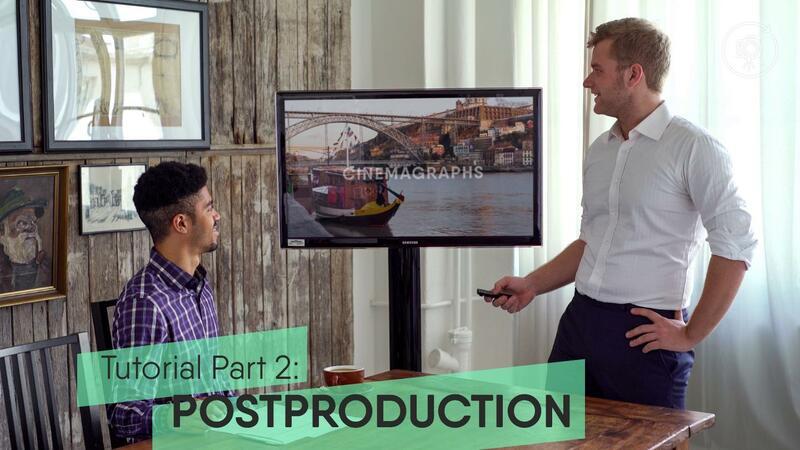 This week, part two: bringing it all together and editing your cinemagraph in Photoshop. Now let’s take a look at editing (moving) images in Photoshop. I’ll begin by pulling the MP4 file into Photoshop. On the timeline you can play the video by pressing the spacebar. Then I could look for a frame that I liked and use this to create a static image on a new layer (Shift + alt + cmd + E). For now we let’s make this layer invisible by hiding the layer. In this particular case we also had video material in which the person on the right hand side left the frame. This makes it easier to separate the person from the moving background. Let’s find a suitable section of the video with a duration of 4 seconds for example (ideally cinemagraphs shouldn’t be much longer than 8 seconds or so). I could now split the remaining video down the middle, into two sections and move the second clip one track higher, as well as moving it back to the very beginning of the timeline. I moved the lower clip backwards a little on the timeline – the two clips should now be overlapping on the timeline. I then selected the “fade out” effect on the timeline and pull it at the end of the upper clip. We now have a video which loops. You can now test how long the fade should last and at which point in the clip it should start. Let’s now make our static image visible again. You need to ensure the static image covers the entire length of the video clip in the timeline window. To create the mask around the person, I’ll create a new layer and use a red brush to trace the edges. When doing this I usually adjust the hardness of the brush according to the edges: when tracing “hard” edges I make sure the hardness of the brush is high and vice-versa. When it comes to hair, I use a different technique, where I increase the contrast between the two elements I wish to separate and use a luminosity mask. Once we’re ready we can select and load the red layer (cmd + click on the layer). Now let’s select our static image once again and click on the “mask” symbol in the bottom right corner. We’ve now combined together the static image with the moving element. In terms of color grading, Photoshop is also able to unleash its full potential when editing video. The Camera Raw Filter works very well here. In order to use this we need to select our clips and convert them into smart objects (right click on the layer > convert to smart object). In this case I’ve converted the static image into a separate smart object, since I wanted to apply a slightly different color grading to it than to the moving element (the curtain). I’ve also done some additional editing using adjustment layers etc. Additionally I’ve placed another cinemagraph inside the TV monitor. Remember to make sure that all the static clips on the timeline have the same duration as the clip containing the element of motion. Once you’re done you can render the cinemagraph. For this, use the “render video” button at the bottom left corner of the timeline. I typically render video with the commonly used H.264 code and normally leave the framerate at 25fps. Changing the framerate of the export from that of the original video can lead to dropped frames. I usually compress the resolution from 4K down to Full HD, since this results in a sharper image when viewed at 100%, and because I often don’t need the 4K resolution. I export cinemagraphs using a bitrate of 16mbps. As it is this video can be uploaded to Facebook or Instagram, where it will automatically play back over and over again. When paired with HTML- or embed codes it can also be played automatically and looped on websites. More and more social media platforms are making it possible to post cinemagraphs. If ever there should be an issue with the implementation of the video file, for instance if for some reason it isn’t possible to loop the video, you can export the cinemagraph in the gif format, (File > Export > Save for Web / cmd + alt + shift + S) which loops natively. The method that I’ve described is one of three effects commonly used in cinemagraphs. Instead of using the fade you can also use a “hard cut” or the “bouncing loop” a.k.a. “forwards-reverse” effect, all of which are possible within Photoshop. To apply a hard cut, just cut the video at the right frame, creating a seamless loop, however this only works with perfectly repetitive movements, such as a rotating carousel or swinging pendulum. To apply the “forwards-reverse” effect you first play back a movement normally, and then play it back in reverse. This way the moving element eventually returns to it’s point of origin. Here you have to be careful that the movement doesn’t begin to feel too robotic. The more you test these effects, the more you will get a sense of which effect is the right one and why. You’ll also quickly learn which movements work well and develop an “eye for cinemagraphs.” The nice thing is, that there’s more movement around us than you might think! And if there’s no movement you can easily create your own with a bit of imagination. Just like in this cinemagraph. The first part of the tutorial you’ll find here. If you have any questions, don’t hesitate to write me at lydia@gallereplay.com.